Mill Hill School is situated on The Ridgeway, an ancient trackway used and adapted during the past 2000 years by various settlers including the Romans, Saxons, Danes and Normans. On either side of the ridge the ground slopes steeply away to give spectacular views to surrounding countryside. The Mill Hill School Foundation occupies a 150-acre site, part of which formed the gardens of Ridgeway House, the house of botanist Peter Collinson. Many of the species that Collinson introduced to Mill Hill in the 18th Century continue to flourish today in the grounds of the School and do much to provide the unique and beautiful setting the School enjoys. The School was set up in 1807 by merchants and ministers from Christian non conformist backgrounds in order to provide a place of learning for the boys from their communities: the “ancient” public schools at this time required all their pupils to belong to the Church of England. They decided to place their School outside of London: their foresight has provided generations of Millhillians with surroundings which are peaceful, secure and rural and yet within minutes of links to Central London. As non conformists, those shaping the original curriculum for the School sought to provide a more radical and modern approach to learning than was available at the time. Within the curriculum of the 1820s can be found “experimental philosophy”, chemistry and ‘general electrical science’, all of which were pathfinding subjects at the time. Today, as part of its objectives, the School continues to seek to provide “a forward looking curriculum which ..is ..broad and flexible enough to adapt to the demands of the 21st century”. 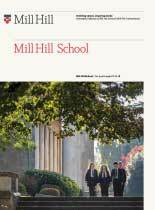 Initially a boys only school, Mill Hill welcomed girls into the Sixth Form in 1975 and went fully co-educational in 1997.